I hope that in this set of Haiku, I've managed to convey the traditional importance of the Cherry Blossom Season in Japan. 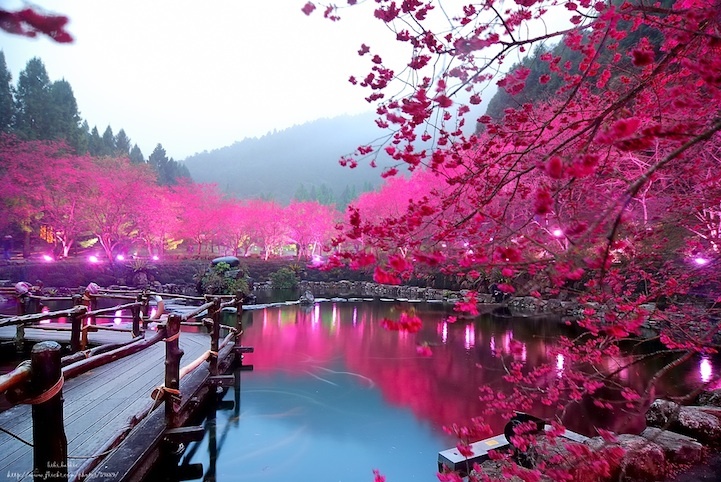 Cherry blossoms are the symbolic flower of the spring, a time of renewal and the fleeting nature of life. Their life span is very short. After their beauty peaks around two weeks, the blossoms start to fall. I liken these flowers to the beautiful Heavenly elusive Muses, the daughters of Zeus. Maria the pictures and your garland of Haiku are wonderful! How I wish I could see Japan at that time. Hi Maria: A beautiful haiku garland. My deepest compliments. You have beautified spring to its height within this beautiful poem. Concept so beautifully put down within the frame of prerequisites of haiku. Bravo! Thanks for your appreciation of the Haiku set Jannie - once again sorry for the late reply. We will be visiting Japan again in the next couple of weeks and hopefully will be able to catch the tail end of the beautiful Cherry Blossoms. I've been away so haven't had a chance to thank you Vlad for your most flattering comments. I truly appreciate your review. Brilliant set of haiku's Maria. I haven't attempted a series of haiku's myself yet, you've inspired me to have a go. Thank you Elizabeth. I do have a Japanese inspiration in my lovely daughter-in-law, who has taught me a lot. You should have a go, remember its all to do with nature on the first two lines, as she reminds me. Thank you so much Paul, as I said in my other comments that I did not know anything about Haiku till my lovely Japanese daughter-in -law introduced me to it, and I was lucky enough to witness this beautiful season at their wedding. Everyone should witness it. Good Morning Maria. How beautiful. You did an excellent job with the format. I have such respect for those who write in this style and its uniqueness. Your words are vibrant and clear and alive. Nature is so amazing no matter what season or flower/plant. The images you shared are stunning. Well done entirely. Thanks Charles for the visit and kind comment. This is praise indeed from the POTW. It makes me blush like the flowers on the Cherry Blossom trees. A gracious thank you Charlie. Thanks so much Matthew, both for the lovely comment and visit. Even though I haven't been to Japan (not around the spring time) each haiku paints a picture for me on what it's like to experience the cherry blossoms. Well done! Thanks for your remarks. Yes indeed you must experience the two weeks of the Cherry Blossom season - One of life's treats never to be missed - We've been many times and never tire of it. Congrats, you've captured the moment! Not just conveyed but brought into life the importance of the Japanese tradition of Cherry blossom dear Maria! A seven for each Haiku! just lovely. I really felt the 'pink' in this poem! Thanks Gayle - if you've ever been to Japan during the season you will live and taste it too. And a hugs back to you too for your appreciation Anne-Lise. I hope you know, this is both so creative and beautiful, I loved this! Excellent. Well penned. A lovely spring poem with beautiful sight. Enjoyed reading it. Thanks for sharing it.